Water. Water helps flush our systems of waste products and toxins, yet many people go through life dehydrated—causing tiredness, low energy, and headaches. It’s common to mistake thirst for hunger, so staying well hydrated will also help you make healthier food choices. Exercise. Find something active that you like to do and add it to your day, just like you would add healthy greens, blueberries, or salmon. The benefits of lifelong exercise are abundant and regular exercise may even motivate you to make healthy food choices a habit. People often think of healthy eating as an all or nothing proposition, but a key foundation for any healthy diet is moderation. But what is moderation? In essence, it means eating only as much food as your body needs. You should feel satisfied at the end of a meal, but not stuffed. Moderation is also about balance. Despite what certain fad diets would have you believe, we all need a balance of carbohydrates, protein, fat, fiber, vitamins, and minerals to sustain a healthy body. The goal of healthy eating is to develop a diet that you can maintain for life, not just a few weeks or months, or until you’ve hit your ideal weight. For most of us, that means eating less than we do now. More specifically, it means eating far less of the unhealthy stuff (refined sugar, saturated fat, for example) and replacing it with the healthy (such as fresh fruit and vegetables). But it doesn’t mean eliminating the foods you love. Eating bacon for breakfast once a week, for example, could be considered moderation if you follow it with a healthy lunch and dinner—but not if you follow it with a box of donuts and a sausage pizza. If you eat 100 calories of chocolate one afternoon, balance it out by deducting 100 calories from your evening meal. 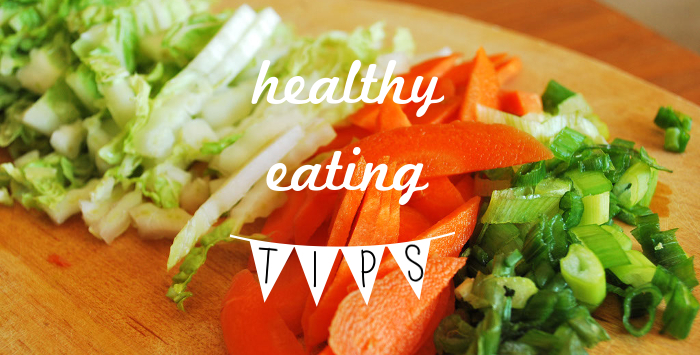 If you’re still hungry, fill up with an extra serving of fresh vegetables. Fruits and vegetables are the foundation of a healthy diet. They are low in calories and nutrient dense, which means they are packed with vitamins, minerals, antioxidants, and fiber. Unfortunately, most people are falling short of the recommended daily minimum of five servings of fruit and vegetables. In fact, most of us need to double the amount we currently eat. Try to eat a rainbow of fruits and vegetables every day and with every meal—the brighter the better. Colorful, deeply colored fruits and vegetables contain higher concentrations of vitamins, minerals, and antioxidants—and different colors provide different benefits, so eat a variety. Aim for a minimum of five portions each day. Try adding berries to breakfast cereals, eating fruit as a healthy dessert, and snacking on vegetables such as carrots, snow peas, or cherry tomatoes instead of processed snack foods. The antioxidants and other nutrients in fruits and vegetables help protect against certain types of cancer and other diseases. And while advertisements abound for supplements promising to deliver the nutritional benefits of fruits and vegetables in pill or powder form, research suggests that it’s just not the same. A daily regimen of nutritional supplements is not going to have the same impact of eating right. That’s because the benefits of fruits and vegetables don’t come from a single vitamin or an isolated antioxidant. The health benefits of fruits and vegetables come from numerous vitamins, minerals, and phytochemicals working together synergistically. They can’t be broken down into the sum of their parts or replicated in pill form. Healthy carbs (sometimes known as good carbs) include whole grains, beans, fruits, and vegetables. Healthy carbs are digested slowly, helping you feel full longer and keeping blood sugar and insulin levels stable. Unhealthy carbs (or bad carbs) are foods such as white flour, refined sugar, and white rice that have been stripped of all bran, fiber, and nutrients. Unhealthy carbs digest quickly and cause spikes in blood sugar levels and energy. Calcium is one of the key nutrients that your body needs in order to stay strong and healthy. Your body uses it to build healthy bones and teeth, keep them strong as you age, send messages through the nervous system, and regulate the heart’s rhythm. If you don’t get enough calcium in your diet, your body will take calcium from your bones to ensure normal cell function, which can lead to osteoporosis. Recommended calcium levels are 1000 mg per day, 1200 mg if you are over 50 years old. Try to get as much of your daily calcium needs from food as possible and use only low-dose calcium supplements to make up any shortfall. Eat plenty of calcium-rich foods, limit foods that deplete your body’s calcium stores (caffeine, alcohol, sugary drinks), do weight-bearing exercise, and get a daily dose of magnesium and vitamins D and K—nutrients that help calcium do its job. For more on the importance of calcium, see Calcium and Bone Health. Protein needs are based on weight rather than calorie intake. Adults should eat at least 0.8g of lean, high-quality protein per kilogram (2.2lb) of body weight per day. A higher intake may help to lower your risk for obesity, osteoporosis, type 2 diabetes, and stroke. The key to ensuring you eat high-quality protein is to try different types, rather than relying on red meat and whole milk dairy products which are high in saturated fat. Replacing processed carbs with high-quality protein can improve your good cholesterol and reduce your risk for heart disease and stroke. You’ll also feel full longer, which can help you lose weight. Since fiber stays in the stomach longer than other foods, the feeling of fullness will stay with you much longer, helping you eat less. Eating plenty of fiber can also move fat through your digestive system at a faster rate so that less of it can be absorbed. And when you fill up on high-fiber foods, you’ll also have more energy for exercising. To learn more, read High-Fiber Foods.